The holidays may be over but winter certainly isn’t, especially here in Montana. After a month of munching on festive goodies and spending time cuddled inside, it’s tough to keep kids active during the coldest months of the year — but it’s just as important, if not more, to do so. Global studies have long confirmed the health benefits of physical fitness in kids: not only does regular exercise promote lifelong weight control, but it also improves sleep and performance in school, promotes stronger muscle and bone growth, and just generally encourages a positive outlook on life. As the days shorten and the sun spends less time being visible, fitness and its various benefits are key to keeping kids happy and engaged. Scouts BSA has been devoted to personal fitness from the very beginning — the Scout Oath even includes a line about Scouts keeping themselves “physically strong”. Millions of Scouts have already earned the Personal Fitness merit badge, which is required to achieve Eagle Scout rank. 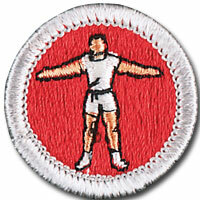 Scouts BSA Personal Fitness merit badge with stitched man wearing white athletic clothing. Courtesy of meritbadge.org. 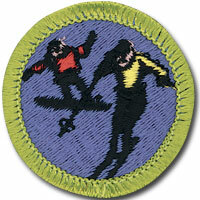 Scouts BSA Snow Sports merit badge, with stitched figures skiing and snowboarding. Courtesy of meritbadge.org. 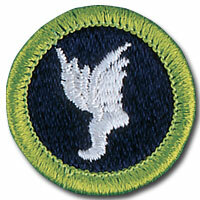 Scouts BSA Athletics merit badge with stitched white foot with wings. Courtesy of meritbadge.org. 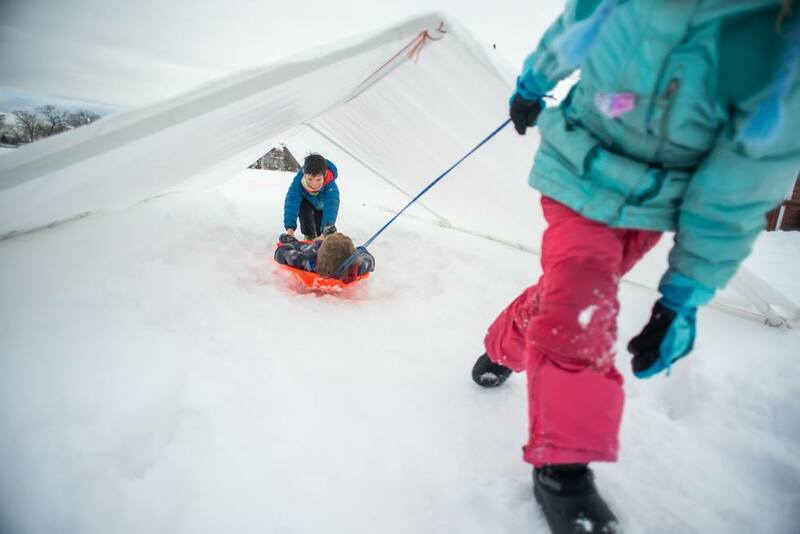 With fitness and outdoor exploration as two of the values at the top of our priority list, the Scouts BSA Montana Council has put together another sort of list: the following is 10 family activities to keep your child physically engaged in winter. Similar to musical chairs (just without the chairs), freeze dance is a fun way to get your younger child moving. Add a few of their favorite, upbeat tunes to the cue, and pause randomly while they’re dancing — anyone who keeps moving after the music has stopped is out for the round! Let the kids do the heavy lifting while building your own indoor castle. After construction’s done, a fort can also be a fun place to read, play with toys or other activities to get your child’s mind in motion. There’s an entire library of free, online yoga classes at your fingertips — some filmed specifically for kids. It’s never been easier to teach your child some yoga poses, reaping all the benefits of stretching and meditation. For some more active kids, meditation might feel like a reach — so shoot for a class with more active poses (combining yoga and aerobics) to really challenge everyone watching. To get kids outside of the house, you can also look for child/parent classes at your local community fitness spot. Hallway races can be a great way to engage even the most competitive Cub Scout. Use a stopwatch to measure how fast your child can run, skip, hop or dance the length of your longest hallway. Compare times among other family members, too! Especially for the older Scouts who have maybe lost interest in blanket forts or hallway races, indoor sports can be one of the best ways of getting active during the winter. Sports traditionally played indoors are available year-round, like basketball, volleyball or gymnastics, but there are also indoor alternatives to sports usually played outdoors, like soccer, rock climbing or tennis. The easiest way to appreciate the icy nature of winter is to dedicate some time to a winter sport. 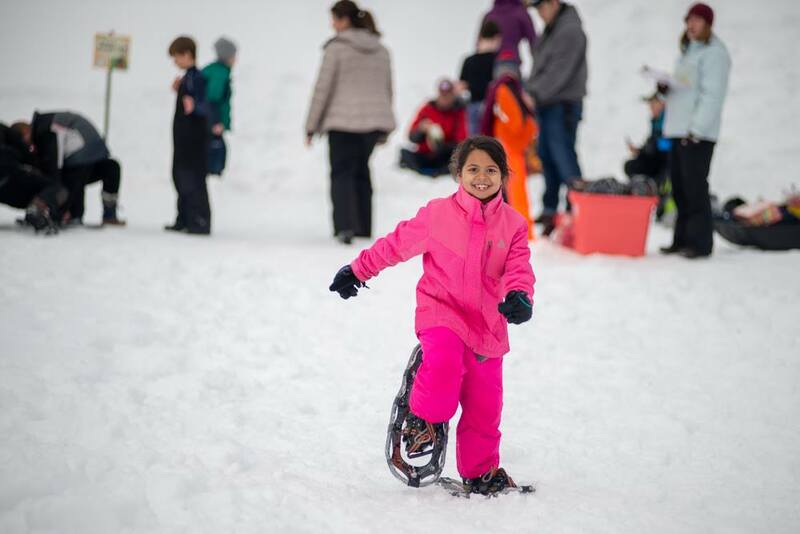 Whether it’s taking a class, signing up for an organized day trip, joining a league or just learning on their own time, kids sporting in the winter not only keeps them occupied, but they often find lifelong interests and improve upon skills each year. Try any number of sports, only available when there’s snow and ice: downhill skiing, cross-country skiing, snowboarding, snowshoeing, hockey, or figure skating. It’s amazing what kids will come up with when given the chance to get creative in seasonal surroundings. Everything from snowmen to snow angels to igloos starts to appear all around the neighborhood! 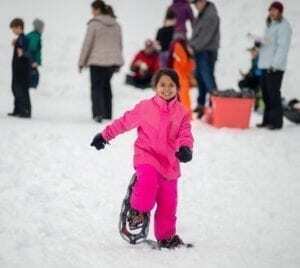 Depending on how far the nearest hill is from your home, sledding can be a great after-school activity on weekdays or an all-day family event on the weekends. Tubes used for floating in the winter can make excellent sleds, if there’s a shortage of supplies! Carving out a spot on your local pond or lake means winter entertainment for an entire community. Keep in mind, however, that some bodies of water don’t freeze enough to support recreators, despite misleading snowy covers. Protect yourself and your kids by proceeding cautiously. Bundle up and walk with the kids to the nearest destination — it could be the neighborhood playground seen through a new, frosty lens, or maybe a nearby cafe serving up the best hot chocolate in town. Winter camping, while using safe winter weather practices, can occupy full weekends with family fun! 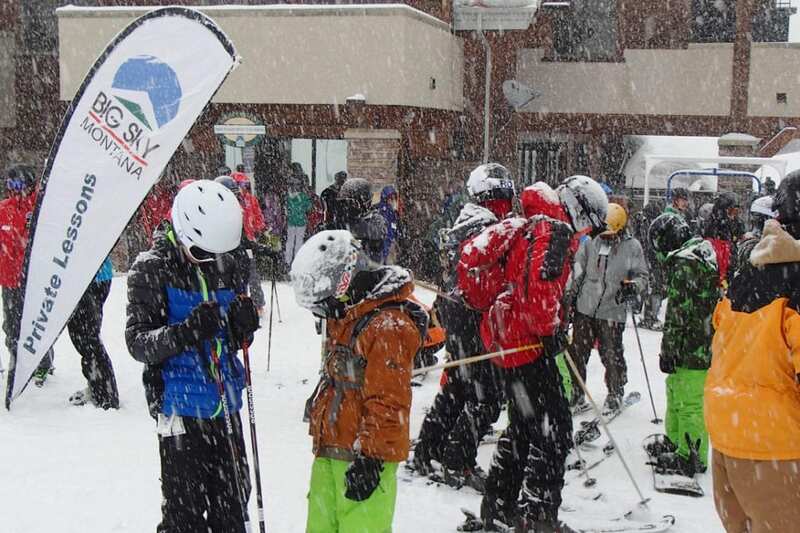 Of course, Scouts are still Scouting even in winter — the Big Sky Ski Weekend is an excellent example of how kids in Scouts BSA come together to play outside and have fun all year long!